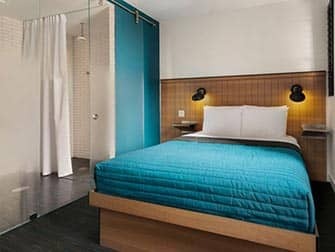 The Pod Hotel 39 in New York is a modern and affordable hotel with a good location in the heart of Manhattan. Their philosophy is very clear, “out with the excessive and the unnecessary”, and they offer exactly that: small but stylish rooms with “all you need and nothing you don’t” for a very competitive price. The hotel has a funny vibe, and it’s a good choice if you’re travelling alone. The Pod Hotel 39 has 7 different kind of rooms, so you can choose depending on your necessities. It’s true that they are all quite small, but the design makes you feel otherwise. 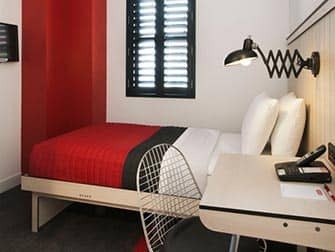 All bedrooms are bright and have a private bathroom, hairdryer, iron and a few extras: you can play your music in the in-room media centre, watch a movie in your own flat screen, control the lights and the climate and of course show your friends all your adventures with the fast free wi-fi. 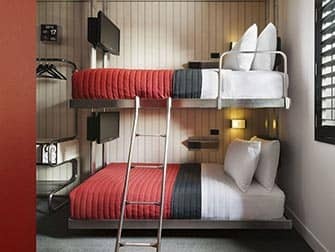 The Pod Hotel 39 wants to compensate for the small size of the rooms with a lot of communal space. The Playroom & Bar is a comfortable space for relaxing: perfect to grab a bite, challenge another guest to a game of ping pong, warm-up by the fireplace or enjoy a game with your friends. They also have two private rooms where you can watch your favourite team playing. And the best part: there is a nice lounge on the rooftop! 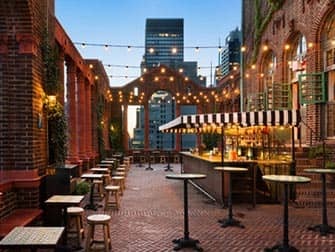 Pod 39 is set in a historical Renaissance building and the exterior is unchanged, so the rooftop looks quite magical with its ancient arches and columns. The views over Murray Hill are amazing, and you can catch a spectacular sunset cocktail in hand. 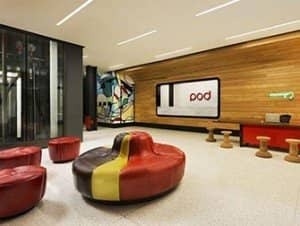 The Pod Hotel 39 has a super location in the heart of the city. Murray Hill is just 20 minutes away from Times Square or the Empire State Building, Grand Central Terminal is around the corner and Bryant Park is just a 5 minute walk. The area is full of shops, art galleries and nice restaurants. 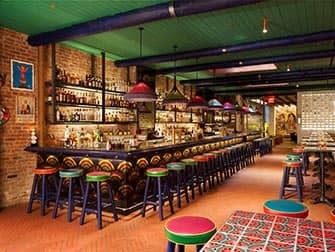 You can always eat in the Mexican cantina inside the hotel, Salvation Taco, but if you’re looking for a good burger Shake Shack is just next door. Eric’s Tip: The Pod Hotel 39 is a modern hotel with a good atmosphere and fits most budgets. It’s easy to meet people in the communal spaces, so a great choice if you’re travelling alone. 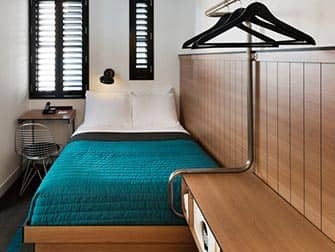 If it’s fully booked, try The Pod Hotel 51.